So, Voldemort put parts of his soul into Ginny. J.K. Rowling describes Professor Quirrell's possession by (the barely alive and very fragmented) Voldemort as a "partial Horcrux". Both Quirrell and Ginny did not ultimately lose their souls to Voldemort. Both were subjugated by Voldemort (both tried to fight back) and both were greatly physically depleted by their contact with him. Both housed Voldemort in their very beings, their souls. Neither had the Horcrux spell performed on them, nor were there murders associated with either Ginny or Quirrell (which is required to make a Horcrux). Is Ginny Weasley considered a "temporary Horcrux" in the way that Professor Quirrell is? ★ I'm looking for an answer based in canon (Harry Potter novels, the three supplemental books, documented interviews or information from J.K. Rowling, or Pottermore. 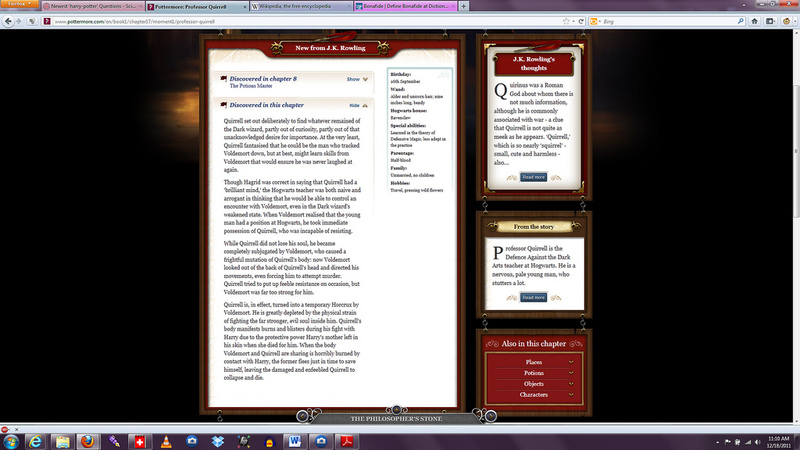 I do not prefer an answer from the HP Wikia or the Wikipedia. I have nothing canon to back it up, but I would say that the book remained the primary repository of the V Soul fragment -- It occasionally went out and controlled her, but it didn't change it's residence to her. It was more of an expanded version of what the Amulet did to the trio while on the run. With Quirrell, he was the primary repository of the fragment, but with Ginny the book still housed the fragment. Ginny opened a channel between the fragment and her self by 'pouring out her soul', but the fragment never actually took up residence in her as V did with Quirrell -- it just controlled her. Ginny was possessed by a portion of V's soul, but she didn't become a new vessel for it, as a Horcrux does. "Flit in and out" seems to strongly imply that the possessee does NOT become a container. No, because the horcrux was still made and lived in the diary. It just possessed Ginny to get Harry to come so he could kill him. No, Ginny was not a Horcrux, just a temporary tool for Tom Riddle's evil plan. The diary, the actual Horcrux, was that piece of soul's homebase/headquarters, the one tangible object keeping it earthbound. Inbetween Ginny's periods of possession, the soul had to return to the object Voldemort originally designated it to. I think the end of the 6th book mentioned that souls cannot be attached to a living thing but to a container. People who get emotionally close to horcruxes become susceptible to their power as Ginny did. And the Diary sucked energy from Ginny in order for Riddle to get a "body" back. So no Ginny wasn't a horcrux but rather a source of energy used to reanimate Riddle's Body. The Horcrux rather sucked energy from Ginny rather than transfer itself to Ginny. Now I don't have the direct quotes for all this but I guess that would make Harry's forehead a container and not harry himself? Was Harry actually a Horcrux? After Voldemort left Quirrell's body, did he inhabit his next Horcrux, the diary?